Our next influential member of the FYNIRS community is Kimberly Ervin, who was the chair for many of the 2017 executives in their first year! 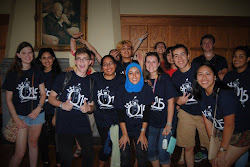 Kim went from being an orientation leader (Landlord) in 2013 to Chair in 2015, which is uncommon in orientation leaders. She will be graduating this year with a degree in Mechanical Engineering. Time Warp Frosh! Wow what a long time ago! The community! I love the people, and I love what we do. First Year would have been lonely and a lot different if I didn't have my FYNIR friends. When I was Chair we had a boat bruise dance, and at the very end we sang the Oil Thigh and we slammed our GPAs. That was unforgettable. I will always remember the team huddle at the very end. It has given me stability. Coming from a different language and a different province, I felt really alone and unfamiliar with the environment. All my fellow first years were in residence, and I really felt alone. FYNIRS have always been there for me; giving me a place to eat lunch during breaks, a place to study and hangout, and a place to find friends. 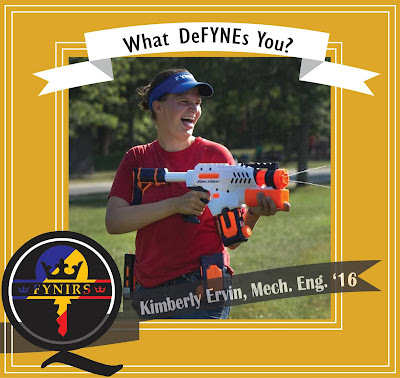 Kim’s dedication and passion for FYNIRS during Orientation Week 2015 was what inspired many of the 2017 executive team to stay involved in the community. Her story is only one of the many who frequent the lounge daily and when she leaves, she will be missed. We would like to wish her all the best in her future endeavors and hope her views on the community that is FYNIRS inspire you to stay connected.